We continue exploring the mechanism of EAV data storage in Magento 2. In this article, we will cover Magento 2 attribute types and how they are presented in the admin. In the 2nd part, we will talk about the role of attribute sets and attribute groups. Attributes are the name (Label) + field, the value of which can be changed by the administrator. frontend_class is used to validate the attribute value in the admin section of the site. In the attribute settings, the property is called Input Validation for Store Owner. For the e-mail validation, the frontend_class property has the value “validate-email”. It is represented as a multi-line field. It is possible to turn on the WYSIWYG editor in its attribute settings. It appears as a text field for entering dates and a drop-down calendar. It is presented in the form of a list that suggests choosing several values, including none. It is represented in the form of a drop-down list that suggests choosing only one value. It appears in the form of a drop-down list. 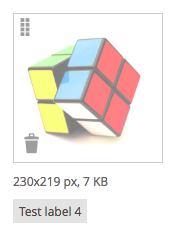 Media Image is represented differently than other fields. There is no field for Media Image. An attribute of the Media Image type adds a role to an image and a video of the product. Allows changing taxes for countries and their states. It is presented in the form of a table with a country and a state and the corresponding tax. Visual Swatch is presented to the administrator the same way as the Dropdown. To a user, it is presented in the form of buttons, filled with color, or containing a picture. The field is convenient to use in Configurable products, for example, for color selection. It is similar to Visual Swatch, only the contents of the button is text. An attribute set is needed in order to display different attributes when editing different types of products (like shoes and clothing). For example, we have the shoe_size and clothing_size attributes. For footwear, you need to display the shoe_size attribute, for clothes — clothing_size. 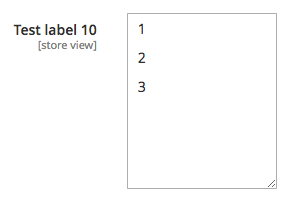 Attribute set allows hiding unnecessary attributes, displaying the necessary ones, changing the sorting and grouping. Groups are needed for the convenience of filling the products by an administrator. They have no effect on the logic of loading / storing the products. 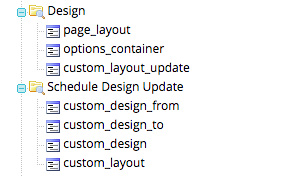 Below you can see the Design and Schedule Design Update folders, which are attribute groups. The nested elements are attributes. That’s it for part 3. The series is to be continued with part 4, in which we will cover additional options when saving EAV entities and customizations based on changes to attribute values. Thank you for the great posts, they are very useful.